Pristine Sea is the twelfth level of Donkey Kong Jungle Beat and the second area of the Pineapple Kingdom. Here, Donkey Kong uses his swimming abilities to progress through the first underwater level. 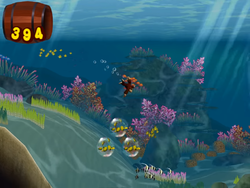 He encounters Banana Squids in this stage, which leave bananas behind when approached, along with underwater flowers and clams that give out bananas when hit by a sound wave. One of the major obstacles in this level is its many ocean currents, which push Donkey Kong through the water and sometimes block important pathways filled with bananas. At the bottom of the ocean, Donkey Kong meets the fourth and final Jungle Buddy, Orco who carries him to the end of the level. After eating the giant pineapple at the end of this stage, Donkey Kong fights Karate Kong on a raging river. Pristine Sea starts on a small beach, where there are a few fairies floating in the air. Donkey Kong can send a sound wave at them to make bananas appear. Following the short pathway down the beach can take Donkey Kong into the ocean, where he can find many bananas beneath the seaweed. A few plants and clams can also be found farther into the water, and they shoot bananas at the ape if they are hit by his sound waves. After passing the second clam, Donkey Kong is swept away over a small area of land by a current. If he manages to swim under this current, he can find more clams and banana-bearing plants. Farther into the level, one can find a sunken ship, which is filled with many Banana Bunches. By defeating the Needle Poppo at the entrance of the ship, Donkey Kong can make his way into the object. Besides Banana Bunches, the ship is filled with many Pea Jellyfish that explode when hit by too many sound waves, defeating them. At the bottom exit of the ship, leading into a large abyss, there is a small area filled with Banana Bunches that is sealed off by a wall, and only Orco the Jungle Buddy can open the pathway. A wide area is located under the ship, and there a is great amount of space for Donkey Kong to swim through. Flowers grow on the side of this area, and, as the flowers before, they give Donkey Kong bananas. Some bananas are also hidden in the seaweed here. As the Kong heads farther down into the abyss, he can find many yellow fairies that form a trampoline when hit by a sound wave. They can help him travel downwards faster if bounced on. At the bottom of the area, Orco can be found swimming around. Donkey Kong can hold onto the buddy, who quickly takes him back to the surface of the water, where he is sent in the air to a giant pineapple growing on a tree. If he chooses not to bite into this fruit and finish the level, he is pull back into the water by Orco, who continues to pull him through the ocean. He is eventually taken back to the depths of the sea, where the whale is able to bust through a nearby wall, leading to a hidden area. This area loops around back to the entrance, and on the way through it, Donkey Kong is led to many Banana Bunches. The ape is soon taken back to the upper areas of the ocean again by Orco, who can also help him reach Banana Bunches in the air. Eventually, the Kong is, once again, sent towards a giant pineapple, which lets him end the level if he bites into it. This page was last edited on April 12, 2019, at 13:10.